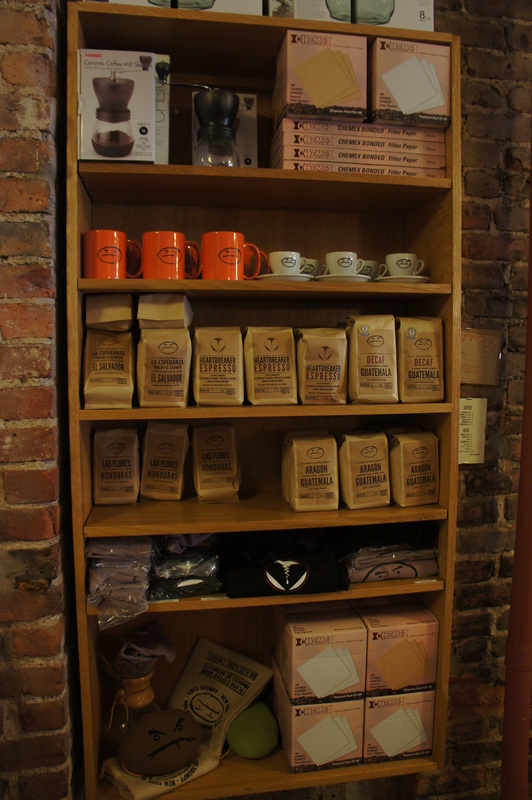 Cafe Grumpy is anything but grumpy; it is a bright, pleasant shop putting out some of the best espresso in Manhattan. I had a chance to visit this charming little store and came to appreciate its uniqueness. Some things about it were delightfully enigmatic; it’s local but it has a catchy logo, its understated but extremely professional, they have everything in terms of variety of offerings and brewing methods and know how excel at all of them. The fact they can pull this all off so well and remain an approachable, warm shop is commendable in and of itself. I haven’t spent all that much time in New York and I only had the chance to visit a handful of shops while I was there. That said, there did seem to be some marked differences between styles of design and coffee production between the coasts. Not trying to create a dichotomy, just noticed some patterns. One thing I absolutely loved about the majority of NY shops was the aesthetic of the stores. Rather than starting from scratch and gutting the insides (as many new third-wave shops in California do, a tried and true method), places like Grumpy seem to have simply worked around integrated their store into the preexisting layout/style of the older buildings. Its charming in a non-campy way; instead of trying to emulate brick and mortar, they are actually brick and mortar. There’s probably an obvious pragmatic reason for this and it’s probably nothing out of the ordinary for New Yorkers, but for a visitor like me, I really enjoyed it. The staff were extremely knowledgeable and friendly. 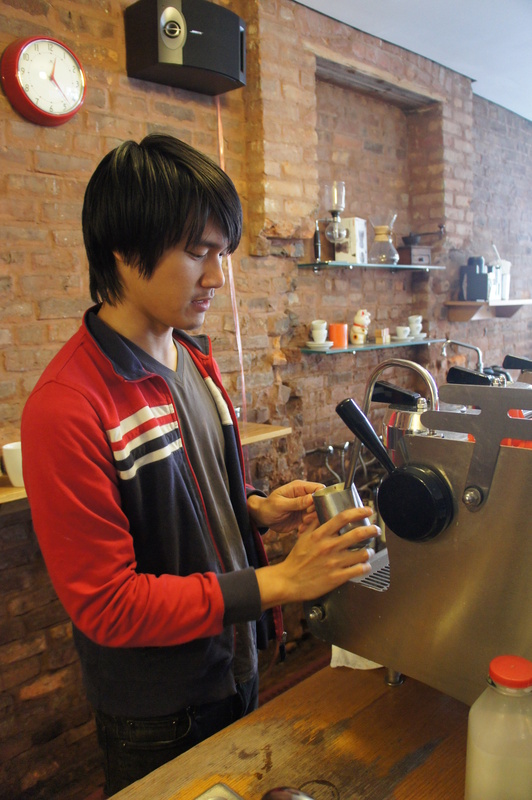 The barista I talked to chatted me up about Synessos and Able-Brewing Kones for about 15 minutes. They do their own roasting, source their own beans, repair their own equipment, keep up with the latest brewing techniques (and equipment), and essentially know the ins-and-outs of the whole process from start to finish. I like baristas that are technically proficient on that level; the gentleman I was talking to wasn’t trying to sell me on which farm the bean came from, he was talking about wiring for their espresso machines and temperature control! People have called me a “coffee otaku (nerd, has a deeper meaning beyond manga)” but man, these guys know their stuff. Its comforting to know your coffee is being to be made by baristas who really understand the know the game from start to finish because you know they are going to do an incredible job. Another point I really enjoyed was despite how “third wave” the shop felt, it had a very “the neighborhood coffee shop” feel to it. The facade was not ostentatious, they are located on a quiet unassuming street off the main drag, they are not in your face about coffee (either literally or figuratively), and they treated me like a regular from the second I walked in, that being the baristas just started talking to me about my trip to New York and mentioned coffee on the side. The store had a youthful, energetic atmosphere. The baristas were definitely pros at their craft. But they weren’t keeping up some invisible barrier between themselves and their customers. Most people there seemed like regulars and the friendly staff gave the shop a homey feel. I suppose I was impressed by the fact that for this kind of shop, one that integrates the old corner cafe with new techniques, they still have a ton of “heart.” I mean this is the kindest and most respectful way: I loved them like I love my “hole-in-the-wall” restaurant gems. The cap and particularly the espresso sealed the deal. The shot had a ton of clarity. It wasn’t overpowering and the distinct flavors were extremely pronounced. My little 6oz cap had an almost buttery heaviness to and the flavors were extremely dynamic, starting out bright and evolving the more I drank. I am used to this characteristic with single origins as straight coffee, but it is not something I experience regularly with espresso, at least not to this degree. The milk was perfectly textured, almost viscous and not foamy at all. Overall, it was very cohesive, well stratified, and had outstanding flavor. Hands down, it was the best cap I had on my trip. At $4 (I guess back when I visited, I thought that was a lot. Now it seems to be industry standard), I say it was well worth the price if you utilize all that Grumpy Coffee has to offer; quality coffee, a knowledgeable staff, and a great atmosphere. Overall I really enjoyed Cafe Grumpy for a few simple reasons; they weren’t trying too hard, they offered and cared about offering a top quality product, their baristas really understood coffee from a technical and consumer side of things, they are self-sufficient in doing their own roasts, and they keep it low-key. Oh, and they have a “cute” logo (see photos on their website). Next Post How do you Aeropress? I’m definitely going to have to check this out, love the location. Great post!